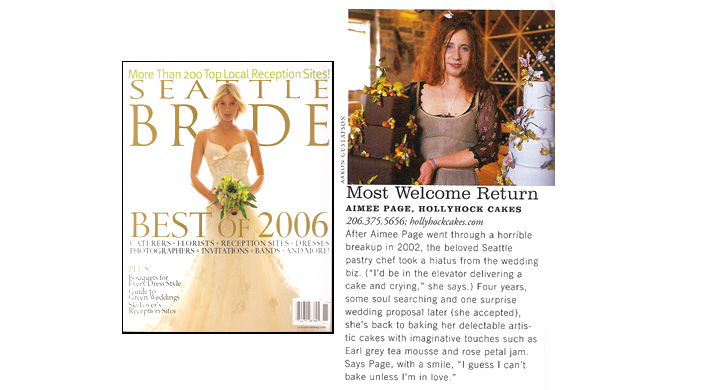 After founding Hollyhock Cakes in Seattle in 1997, Santa Cruz native Aimee Page has returned to her seaside hometown, bringing along her organic, show-stopping wedding cakes and desserts. 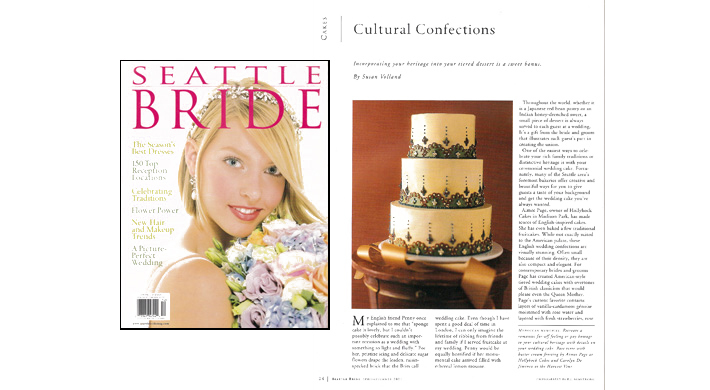 Serving Santa Cruz and the central coast area, from San Francisco to Silicon Valley to Big Sur, Page handcrafts confections of carefully composed flavors and textures inspired by the seasonal farmers’ market. Birthdays just aren't birthdays without a big old cake and a fire-hazardous number of candles. 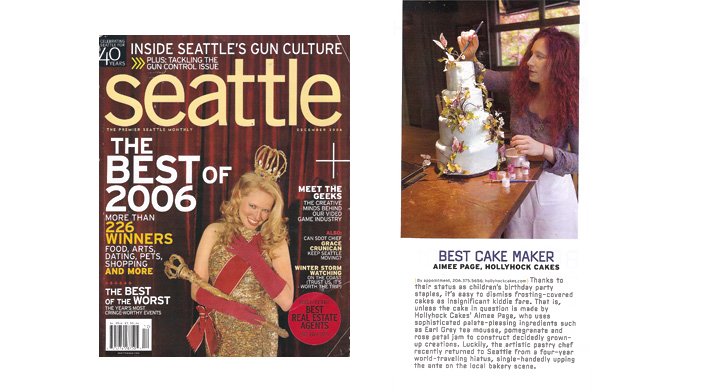 When she's not swamped in the busy season, Aimee Page of Hollyhock Cakes whips up the most incredible creations in the shape of sunflowers, stacked presents- you name it- all with decadent flavors such as mixed-berry tiramisu and banana. Too beautiful to eat, but somehow we find a way. Underneath the glitz, however, is a simple recipe for success. 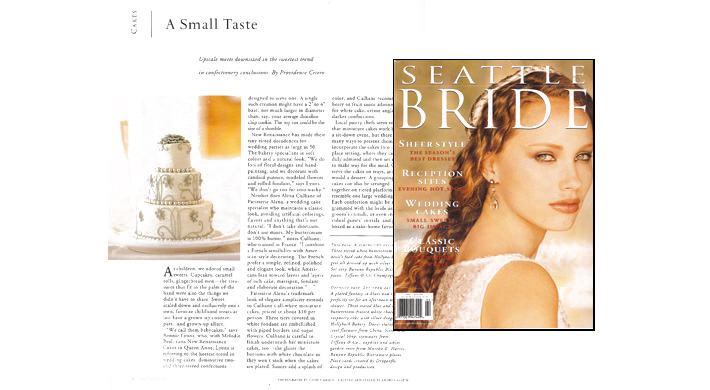 “I believe in the idea of the small village baker, Page says. Every cake must be fresh and individual. 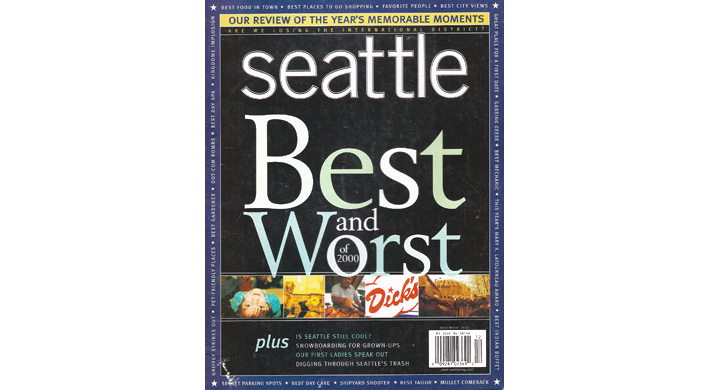 At the Hollyhock bakery on Seattle's Capitol Hill, pastry chef Aimee Page wants each cake-chocolate or no-to have a romantic appeal. 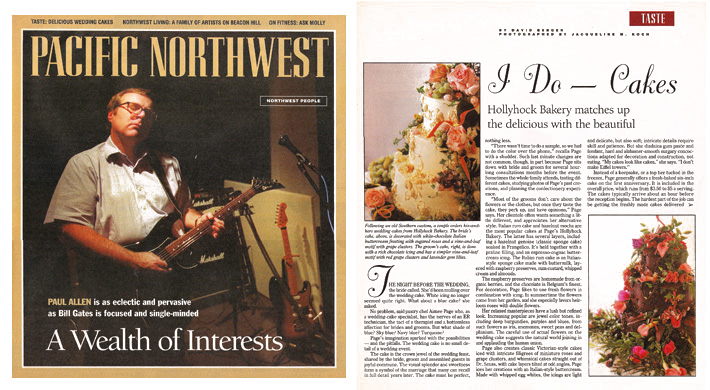 It's a descriptive that fits such hollyhock specialties as the Victorian Rose Torte, a vanilla-cardomom genoise -yes, we're getting those definitions- that's moistened with rosewater, then layered with white chocolate and rose petal mousse. rose petal mousse. As a final touch, the whole is covered with delicate white chocolate and rosewater buttercream. At a reception with a water theme, hand-blown fish bowl centerpieces with live goldfish are upstaged by a three tiered optical illusion. Dusted in silver and bedecked with white lotus flowers and lily pads, the wedding cake is shrouded in a light mist; a tiny water fountain trickles at its center. 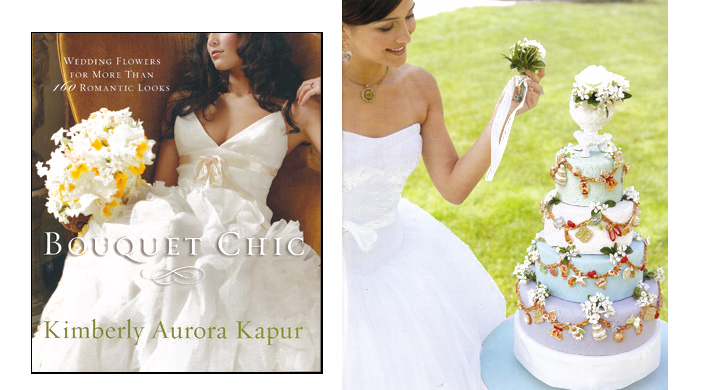 Such a spectacular cake is the result of inspiration, not imitation. 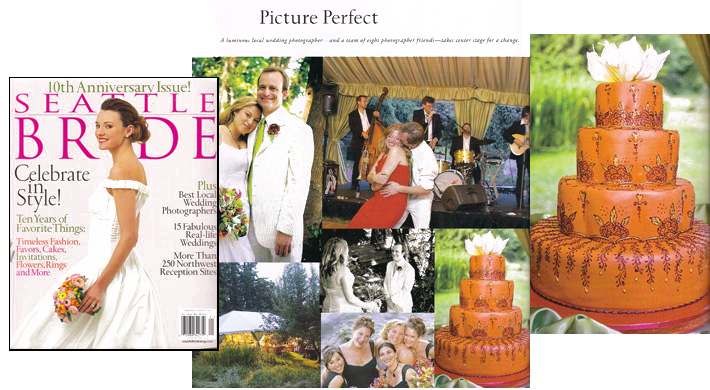 Like self-styled wedding vows, custom-designed rings and hand-made favors, cakes are getting personal. 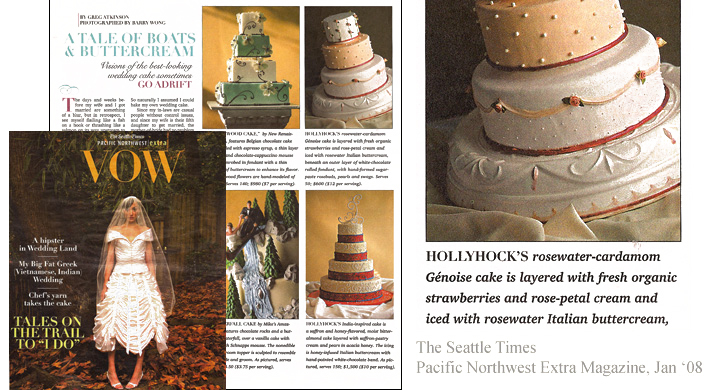 Bearing fabric swatches, tablecloths and memories of their engagement in Volunteer Park, couples are seeking out inventive bakers like watercake creator Aimee Page of Hollyhock Cakes to turn their dreams into one-of-a kind confections that tie the wedding together. 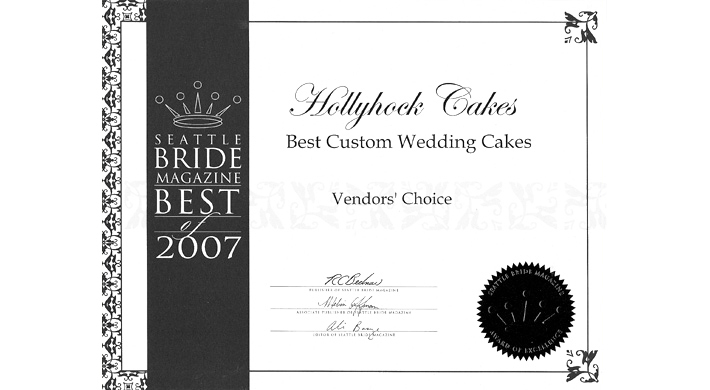 “Cakes of the World is a concept that Page has been pursuing in her recent decorations...Arabic-inspired spice cakes with elaborate tile work, piping and domed tops...."
Aimee Page, owner of Hollyhock Cakes in Madison Park, has made scores of English-inspired cakes. She has even baked a few traditional fruitcakes. While not exactly suited to the American palate, these English wedding confections are visually stunning. Often small because of their density, they are also compact and elegant. 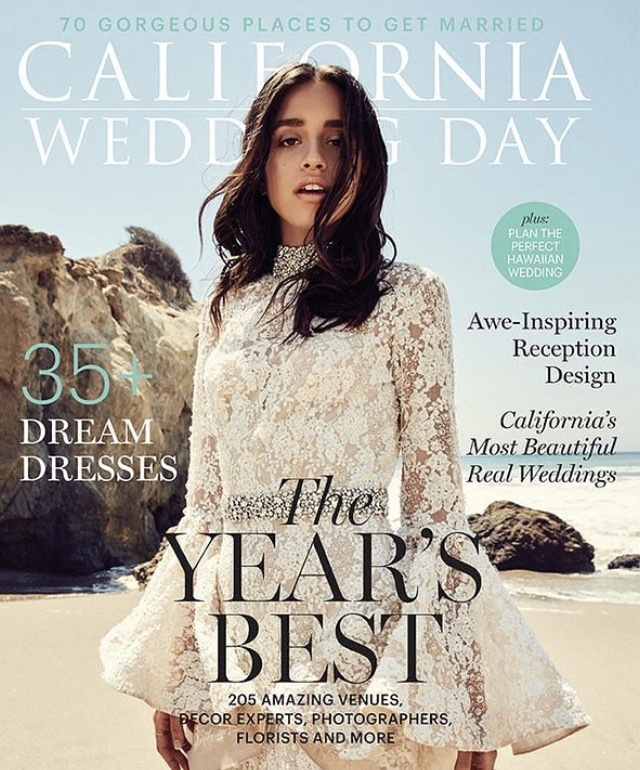 For contemporary brides and grooms Page has created American-style tiered wedding cakes with overtones of British classicism that would please even the Queen Mother. Page`s current favorite contains layers of vanilla-cardamon genoise moistened with rose water and layered with fresh strawberries, rose hip jam and rose petal cream. As an alternative, she might suggest a tier filled with Earl Grey tea- infused mousse. 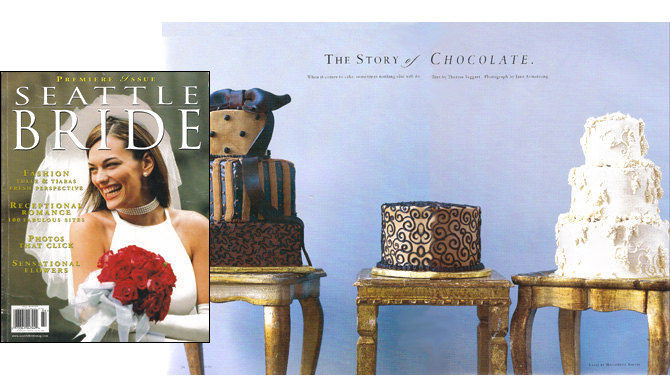 She covers these cakes with traditional rolled fondant and plump sugar roses. 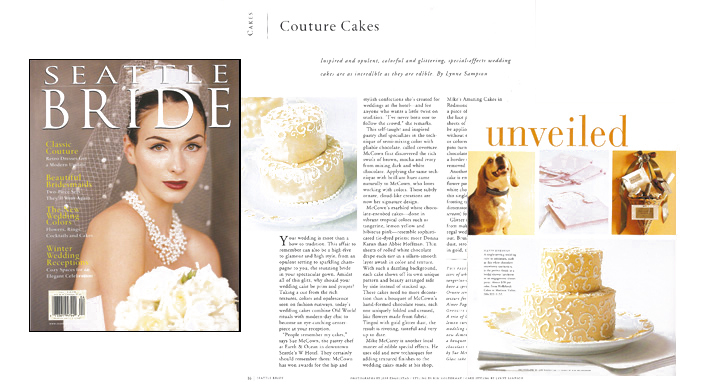 “Cakes of the World is a concept that Page has been pursuing in her recent decorations. 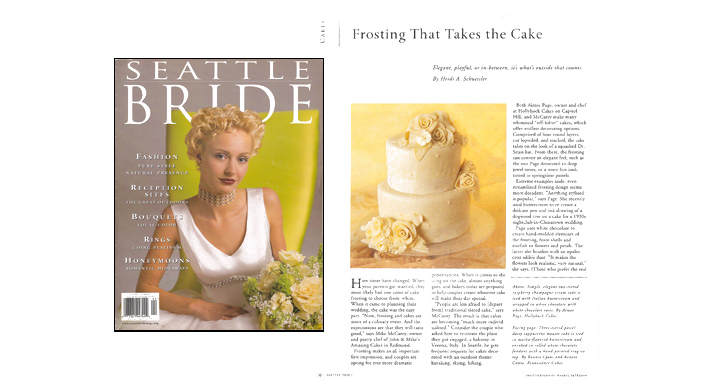 She's seeing more brides and grooms who get creative and abandon a classic white or ivory cake in favor of exotic colors, textures or symbolism. For one Seattle couple who planned a honeymoon in Morocco, a colleague of Page's created Arabic-inspired spice cakes with elaborate tile work, piping and domed tops. 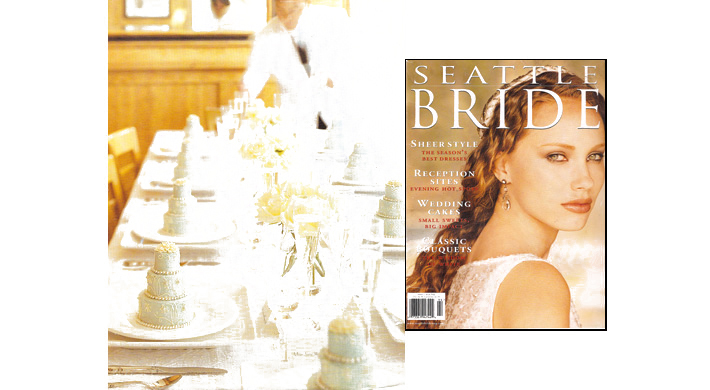 Page has also worked with Indian brides to incorporate the designs of color and patterns in the layers. Since white isn't a celebratory color in many Asian cultures, she has made vivid red cakes ornamented with gold symbols for good luck and prosperity. Another Asian favorite is a tinted a serene blue and decorated with sugar lotus blossoms, lily pads and pedestals molded to look like bamboo. Oranges are symbolic of good fortune and prosperity in Asian cultures, so many of these cakes are flavored with bittersweet chocolate and orange cream. "When you scale down anything that small, detail counts. 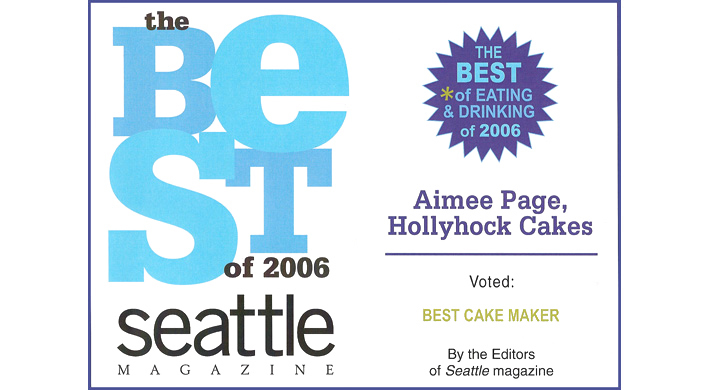 It's got to be perfect," says Aimee Page of Hollyhock Bakery. "These little cakes are very labor intensive." 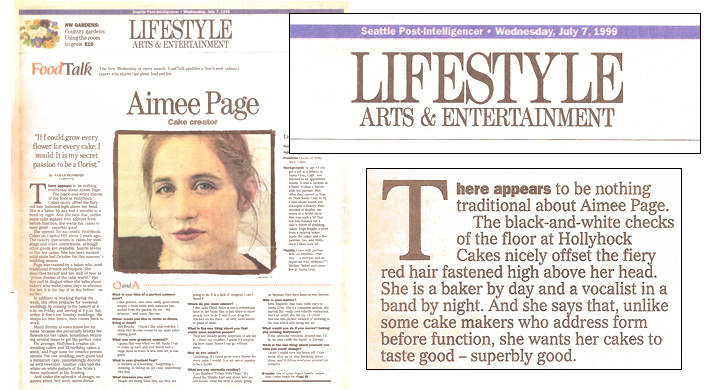 "Page uses an Italian buttercream to create flavors such as orange blossom, white chocolate and rosewater, and espresso-cognac. 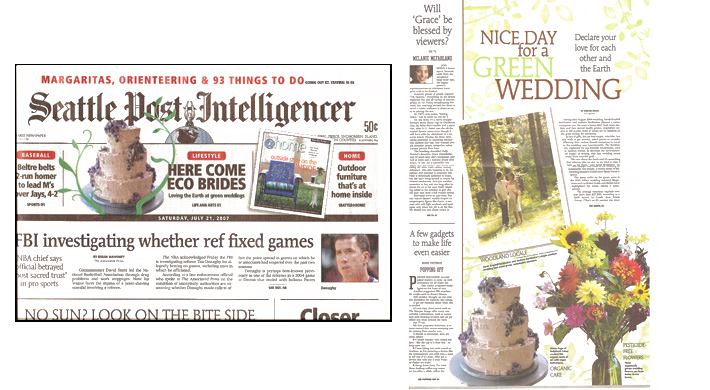 'Planning is all part of the wedding process, and the cake should be the fun part! ', she says"
Above: Simple, elegant two tiered raspberry champagne cream cake is iced with Italian buttercream and wrapped in white chocolate and white chocolate roses. By Aimee Page, Hollyhock Cakes. 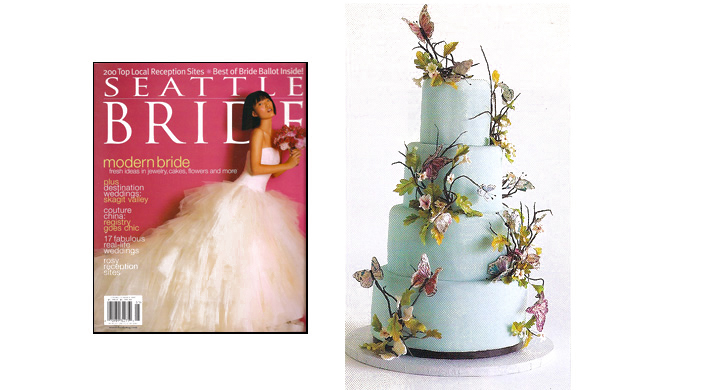 Aimee Page of Hollyhock Cakes created this organic work of art with sugar hydrangeas. Hazelnut mocha cake with layers of hazelnut genoise, hazelnut dacquoise, Frangelio truffle cream, espresso buttercream, and mixed berry tiramisu cake, covered with pale blue white chocolate fondant and handmade sugar-paste twigs, butterflies and spring flowers. 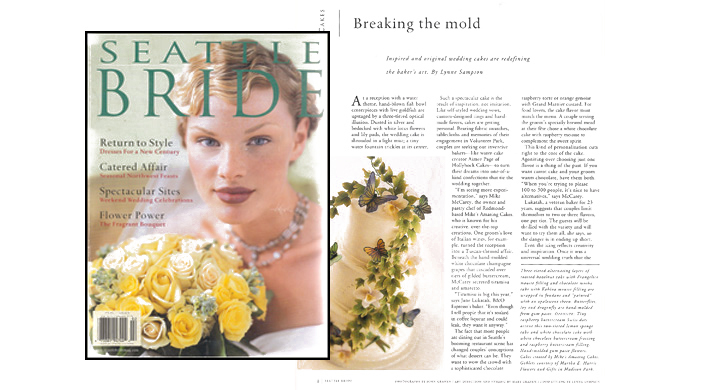 Page likes to use flowers from her garden, and she especially favors heirloom roses with double flowers. Her relaxed masterpieces have a lush but refined look.. Page also creates classic Victorian style cakes iced with filigrees of miniature roses and grape clusters, and whimsical cakes straight out of Dr. Seuss. Says Page, with a smile, "I guess I can't bake unless I'm in love"
Hollyhock Cakes uses sophisticated palate-pleasing ingredients such as earl grey tea, pomegranate and rose-petal jam to construct decidedly grown up creations.